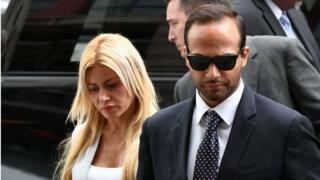 The professor told Papadopoulos the Russians had "dirt" on Mr Trump's Democratic presidential rival Hillary Clinton in the form of "thousands of emails". What did Papadopoulos say he told Donald Trump? The young political operative told Mr Trump, then a Republican presidential candidate, and other members of the campaign's national security team that he could set up a meeting with President Vladimir Putin ahead of the 2016 election. A pre-sentencing statement last week read: "While some in the room rebuffed George's offer, Mr Trump nodded with approval and deferred to Mr Sessions, who appeared to like the idea and stated that the campaign should look into it." Papadopoulos told CNN in an interview aired on Friday that Mr Trump "gave me a sort of a nod" and "wasn't committed either way" about the idea of a meeting with the Russian leader. But he said then-senator and now-Attorney General Jeff Sessions "was actually enthusiastic". Last November, Mr Sessions testified to Congress that he had "pushed back" against Papadopoulos' offer. When the FBI interviewed Papadopoulos in January 2017, he falsely claimed he had met two individuals with Russian ties before he joined the president's team in March 2016. One individual was a Russian woman whom Papadopoulos believed had connections to the Russian government. What effect did the lies have? Prosecutors said Papadopoulos's lack of cooperation with investigators meant they were unable to effectively question or detain Mr Mifsud. The professor has since left the United States. The Democratic National Committee, which is suing Russia, the Trump campaign and WikiLeaks over the alleged election interference in the 2016, filed a court document on Friday, saying Mr Mifsud "was missing and may be deceased", without any further explanation, according to Bloomberg News. He said he lied not to impede investigation but "to preserve a perhaps misguided loyalty to his master". Judge Randolph Moss said he took the "genuine remorse" into consideration for the sentencing. The only other person to be sentenced in the investigation - lawyer Alex Van Der Zwaan - received 30 days in prison. His judge referred to his regret as "muted". Outside court on Friday, Papadopoulos' lawyer, Thomas Breen, said his client was a "fool" and had acted "stupidly" in lying to the FBI. But the attorney said "the president of the United States hindered this investigation more than Papadopoulos ever could". He said Mr Trump had hampered the inquiry by calling it a "witch hunt" and "fake news".